You can create your own TRADING CARD digitally. Reflect on the five standards for teachers as outlined by ISTE and explored throughout this course. Think of five skills you have acquired during this course. How have you demonstrated expertise with these skills? What have you created or completed to model your skills? Use the example shown below to see what your finished card could look like. Use the ISTE standards for teachers as a starting point. Identify five skills from the standards. Select elements that demonstrate, model, or provide evidence that you have acquired those skills. Use this link (http://www.readwritethink.org/classroom-resources/student-interactives/trading-card-creator-30056.html) to access a digital TRADING CARD creator. 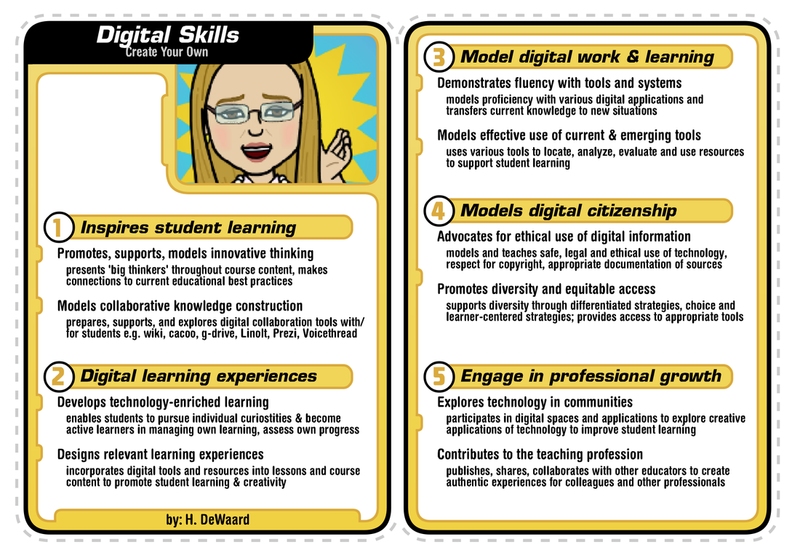 Add your avatar image to the trading card and identify the five skills and evidence of those five skills on the trading card. Save the final card as a pdf file to your computer. You can then take a screen capture image of your trading card to post to your DSP. Post your completed card on your DIGITAL SELF PORTRAIT. Example of a completed trading card.